Logo Lounge has long been one of my favourite logo design inspiration galleries so whenever they release a new book, I know I won’t be disappointed. Logo Lounge Volume 5 was no exception. The fifth volume in the best-selling LogoLounge series provides 2,000 totally new logos from designers worldwide. This book, like the previous titles in the series, is compiled in association with LogoLounge.com, a website that was launched by Bill Gardner in 2002. The site is dedicated to logos. Top designers and design firms are handpicked and invited to be “foundation members.” Foundation and website members each supply multiple logos to the site. Each LogoLounge book presents new logos that have been added to the site, providing designers with an invaluable source for design inspiration and a resource for design solutions. Last year I was lucky enough to be picked as one of their “foundation members” and after submitting several of my logos, two were chosen to be featured in Logo Lounge Volume 5. You can see the photos below. What I like about this book is that it not only features logo designs sorted by category, but it also features whole logo design case studies from high profile design agencies such as Chermayeff & Geismar and Cato Purnell. In particular, I quite enjoyed reading through the Qantas and Woolworths rebrandings. Anyway, I highly recommend you to check out this book and while your at it, you may like to read about my other logo design book recommendations. Front cover of Lounge Lounge Volume 5 with jacket. 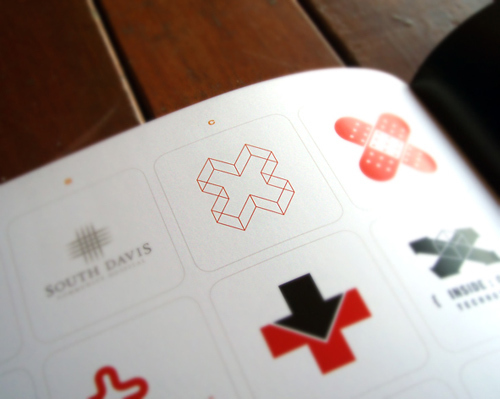 Do you have a favourite logo design book? 0 Response to "Volume 5 Book Review | Chumbart™"